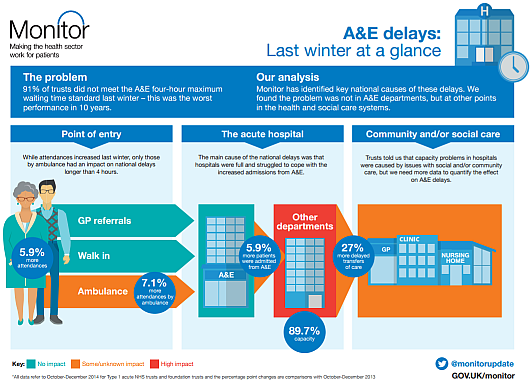 This week an interesting report was published by Monitor – about some possible reasons for the A&E debacle that England experienced in the winter of 2014. 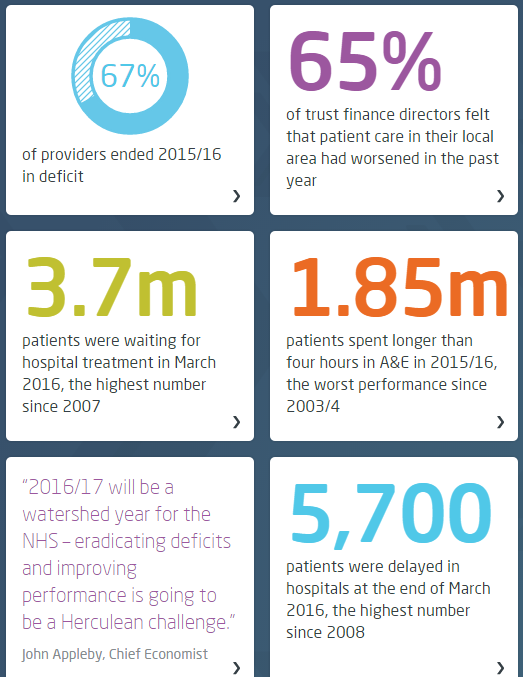 “91% of trusts did not meet the A&E 4-hour maximum waiting time standard last winter – this was the worst performance in 10 years”. So it seems a bit odd that the very detailed econometric analysis and the testing of “Ten Hypotheses” did not look at the pattern of change over the previous 10 years … it just compared Oct-Dec 2014 with the same period for 2013! And the conclusion: “Hospitals were fuller in 2014“. H’mm. 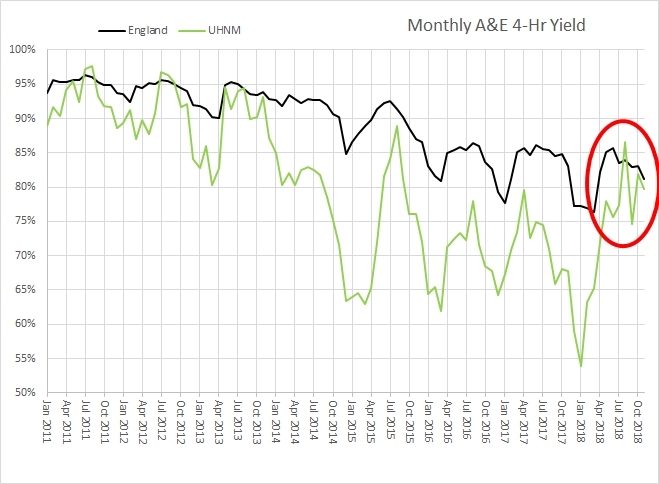 The data needed to look back 10 years is readily available on the various NHS England websites … so here it is plotted as simple time-series charts. 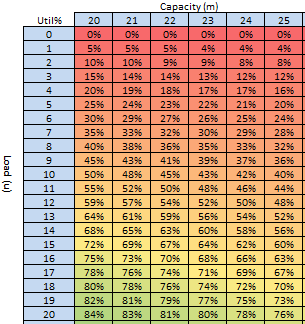 These are called system behaviour charts or SBCs. Our trusted analysis tools will be a Mark I Eyeball connected to the 1.3 kg of wetware between our ears that runs ChimpOS 1.0 … and we will look back 11 years to 2004. 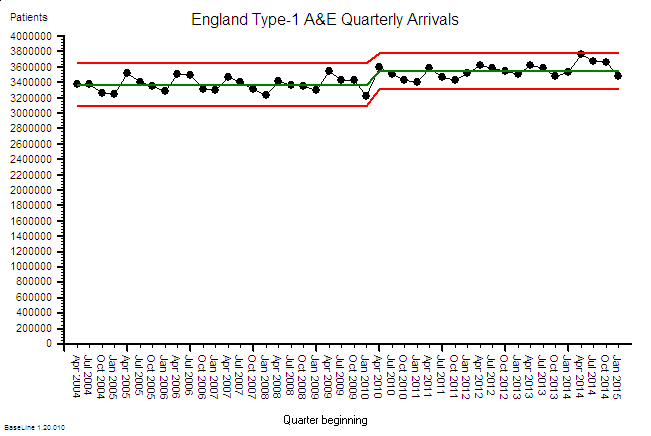 First we have the A&E Arrivals chart … about 3.4 million arrivals per quarter. The annual cycle is obvious … higher in the summer and falling in the winter. 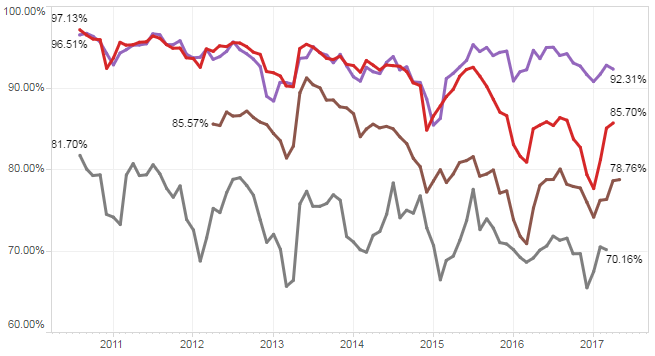 And when we compare the first five years with the last six years there has been a small increase of about 5% and that seems to associate with a change of political direction in 2010. 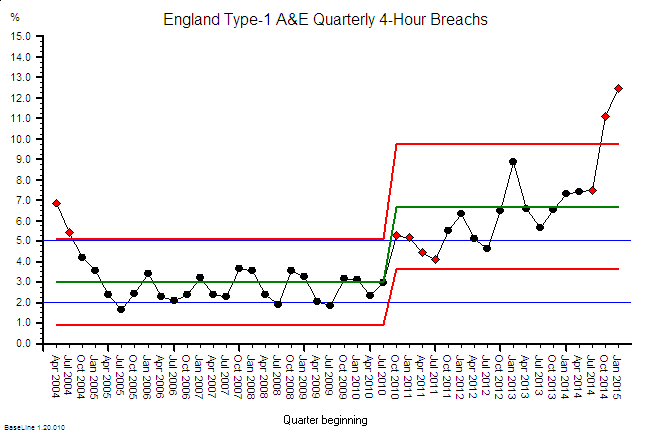 So over 11 years the average A&E demand has gone up … a bit … but only by about 5%. 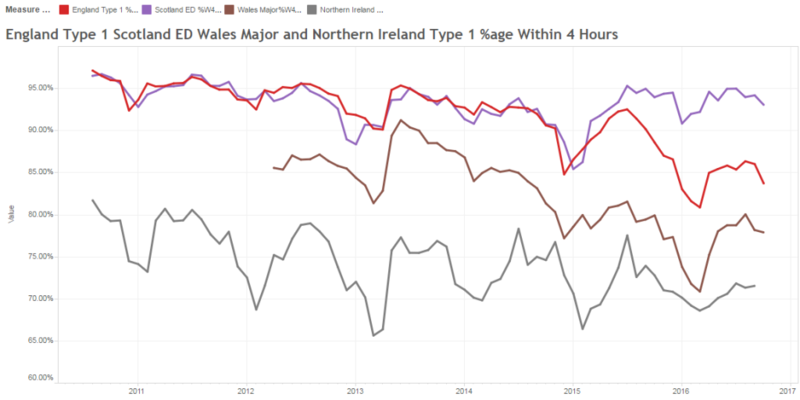 In stark contrast the A&E arrivals that are admitted to hospital has risen relentlessly over the same 11 year period by about 50% … that is about 5% per annum … ten times the increase in arrivals … and with no obvious step in 2010. We can see the annual cycle too. It is a like a ratchet. Click click click. But that does not make sense. Where are these extra admissions going to? 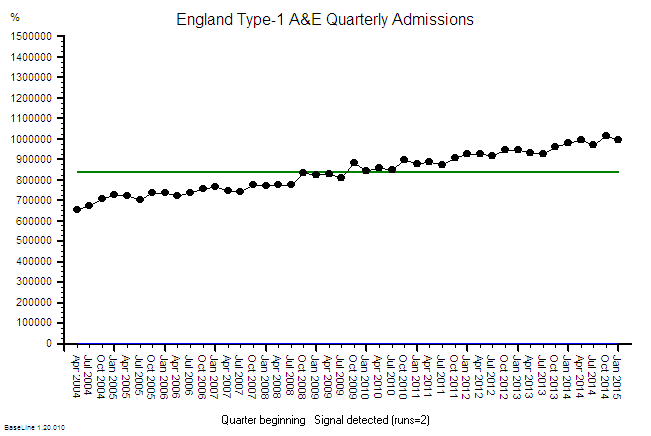 We can only conclude that over 11 years we have progressively added more places to admit A&E patients into. More space-capacity to store admitted patients … so we can stop the 4-hour clock perhaps? More emergency assessment units perhaps? Places to wait with the clock turned off perhaps? The charts imply that our threshold for emergency admission has been falling: Admission has become increasingly the ‘easier option’ for whatever reason. So why is this happening? Do more patients need to be admitted? In a recent empirical study we asked elderly patients about their experience of the emergency process … and we asked them just after they had been discharged … when it was still fresh in their memories. A worrying pattern emerged. Many said that they had been admitted despite them saying they did not want to be. In other words they did not willingly consent to admission … they were coerced. This is anecdotal data so, by implication, it is wholly worthless … yes? Perhaps from a statistical perspective but not from an emotional one. It is a red petticoat being waved that should not be ignored. Blissful ignorance comes from ignoring anecdotal stuff like this. Emotionally uncomfortable anecdotal stories. Ignore the early warning signs and suffer the potentially catastrophic consequences. 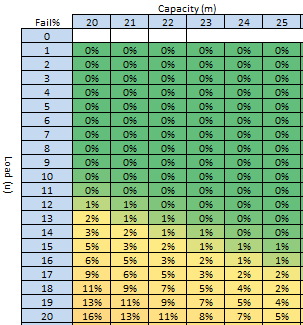 And here is the corresponding A&E 4-hour Target Failure chart. Up to 2010 the imposed target was 98% success (i.e. 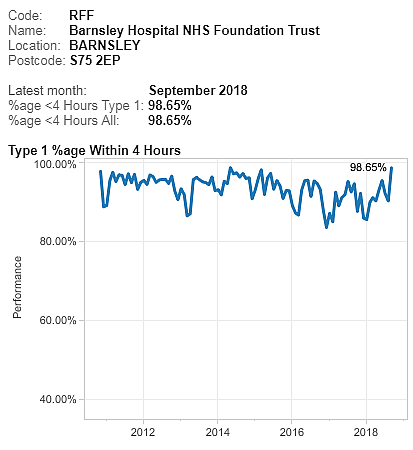 2% acceptable failure) and, after bit of “encouragement” in 2004-5, this was actually achieved in some of the summer months (when the A&E demand was highest remember). But with a change of political direction in 2010 the “hated” 4-hour target was diluted down to 95% … so a 5% failure rate was now ‘acceptable’ politically, operationally … and clinically. So it is no huge surprise that this is what was achieved … for a while at least. 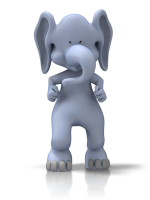 In the period 2010-13 the primary care trusts (PCTs) were dissolved and replaced by clinical commissioning groups (CCGs) … the doctors were handed the ignition keys to the juggernaut that was already heading towards the cliff. The charts suggest that the seeds were already well sown by 2010 for an evolving catastrophe that peaked last year; and the changes in 2010 and 2013 may have just pressed the accelerator pedal a bit harder. And if the trend continues it will be even worse this coming winter. 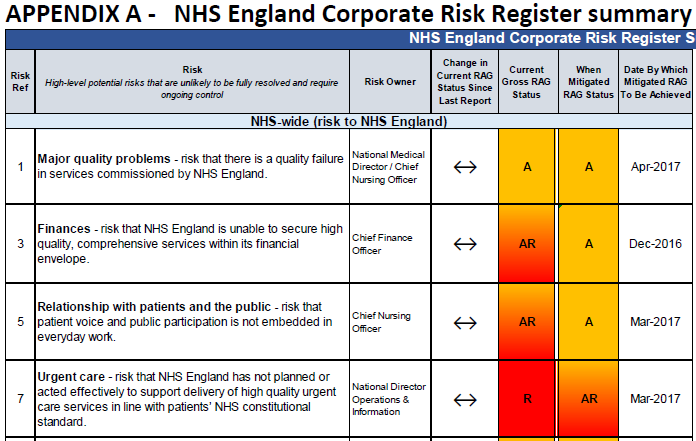 Worse for patients and worse for staff and worse for commissioners and worse for politicians. Lose lose lose lose. 1. 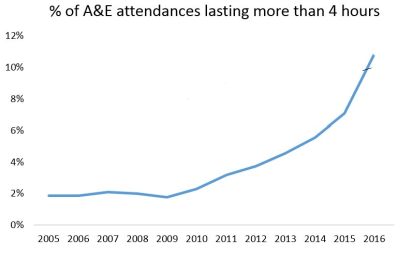 A&E arrivals have gone up 5% over 11 years. 2. Admissions from A&E have gone up 50% over 11 years. 3. 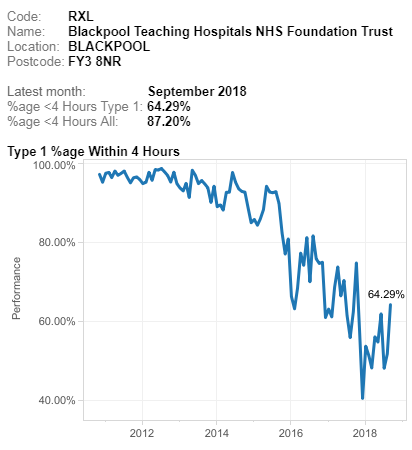 Since lowering the threshold for acceptable A&E performance from 98% to 95% the system has become unstable and “fallen off the cliff” … but remember, a temporal association does not prove causation. So what has triggered the developing catastrophe? 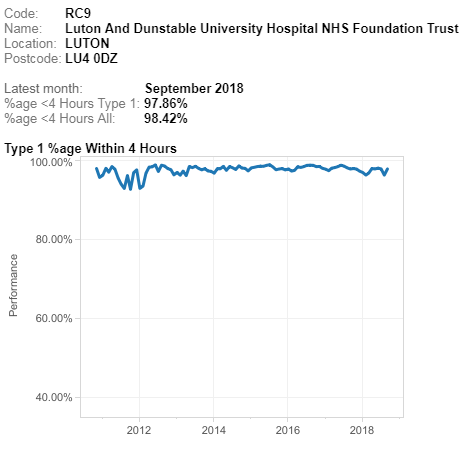 Well, it is important to appreciate that when a patient is admitted to hospital it represents an increase in workload for every part of the system that supports the flow through the hospital … not just the beds. Beds represent space-capacity. They are just where patients are stored. We are talking about flow-capacity; and that means people, consumables, equipment, data and cash. So if we increase emergency admissions by 50% then, if nothing else changes, we will need to increase the flow-capacity by 50% and the space-capacity to store the work-in-progress by 50% too. This is called Little’s Law. It is a mathematically proven Law of Flow Physics. It is not negotiable. So have we increased our flow-capacity and our space-capacity (and our costs) by 50%? I don’t know. That data is not so easy to trawl from the websites. It will be there though … somewhere. What we have seen is an increase in bed occupancy (the red box on Monitor’s graphic above) … but not a 50% increase … that is impossible if the occupancy is already over 85%. A hospital is like a rigid metal box … it cannot easily expand to accommodate a growing queue … so the inevitable result in an increase in the ‘pressure’ inside. We have created an emergency care pressure cooker. Well lots of them actually. And that is exactly what the staff who work inside hospitals says it feels like. 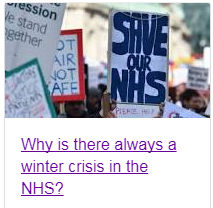 And eventually the relentless pressure and daily hammering causes the system to start to weaken and fail, gradually at first then catastrophically … which is exactly what the NHS England data charts are showing. So what is the solution? More beds? Nope. More beds will create more space and that will relieve the pressure … for a while … but it will not address the root cause of why we are admitting 50% more patients than we used to; and why we seem to need to increase the pressure inside our hospitals to squeeze the patients through the process and extrude them out of the various exit nozzles. Those are the questions we need to have understandable and actionable answers to. 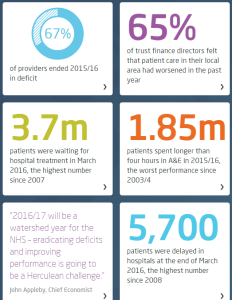 Q1: Why are we admitting 5% more of the same A&E arrivals each year rather than delivering what they need in 4 hours or less and returning them home? That is what the patients are asking for. Q2: Why do we have to push patients through the in-hospital process rather than pulling them through? The staff are willing to work but not inside a pressure cooker. A more sensible improvement strategy is to look at the flow processes within the hospital and ensure that all the steps and stages are pulling together to the agreed goals and plan for each patient. The clinical management plan that was decided when the patient was first seen in A&E. 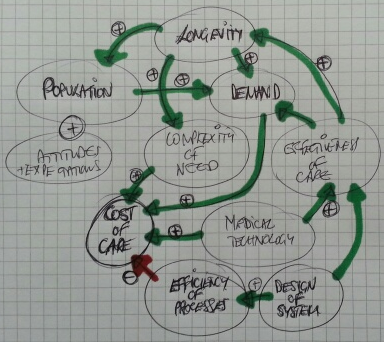 The intended outcome for each patient and the shortest and quickest path to achieving it. 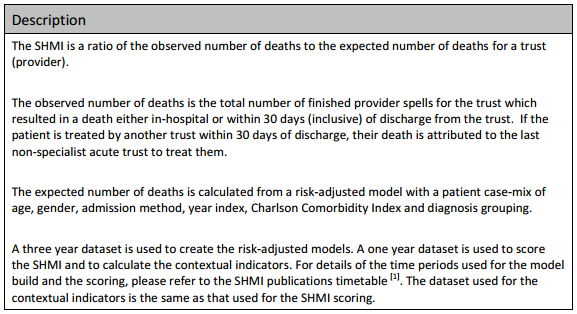 Our target is not just a departure within 4 hours of arriving in A&E … it is a competent diagnosis (study) and an actionable clinical management plan (plan) within 4 hours of arriving; and then a process that is designed to deliver (do) it … for every patient. Right, first time, on time, in full and at a cost we can afford. Q: Do we have that? Q: Is that within our gift to deliver? Q: So what is the reason we are not already doing it? A: Good question. 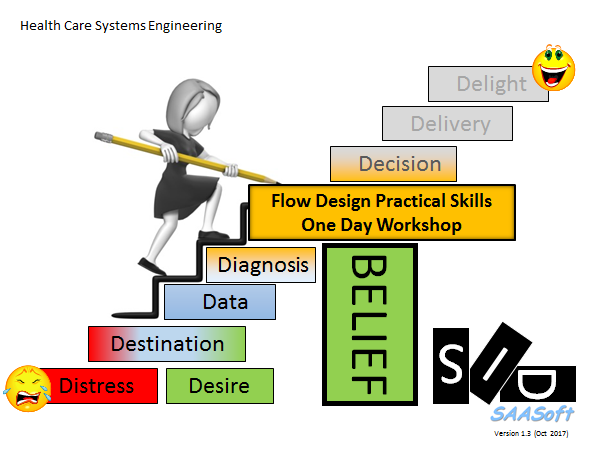 Who in the NHS is trained how to do system-wide flow design like this? “Primum non nocere” is Latin for “First do no harm”. It is a warning mantra that had been repeated by doctors for thousands of years and for good reason. Doctors can be bad for your health. 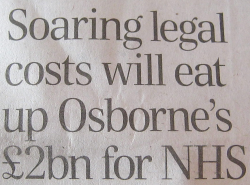 I am not referring to the rare case where the doctor deliberately causes harm. Such people are criminals and deserve to be in prison. I am referring to the much more frequent situation where the doctor has no intention to cause harm – but harm is the outcome anyway. Very often the risk of harm is unavoidable. Healthcare is a high risk business. Seriously unwell patients can be very unstable and very unpredictable. 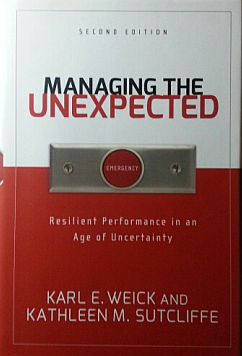 Heroic efforts to do whatever can be done can result in unintended harm and we have to accept those risks. It is the nature of the work. Much of the judgement in healthcare is balancing benefit with risk on a patient by patient basis. It is not an exact science. It requires wisdom, judgement, training and experience. It feels more like an art than a science. The focus of this essay is not the above. It is on unintentionally causing avoidable harm. Or rather unintentionally not preventing avoidable harm which is not quite the same thing. 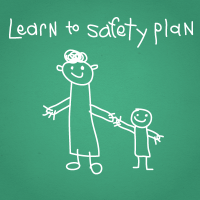 Safety means prevention of avoidable harm. A safe system is one that does that. There is no evidence of harm to collect. 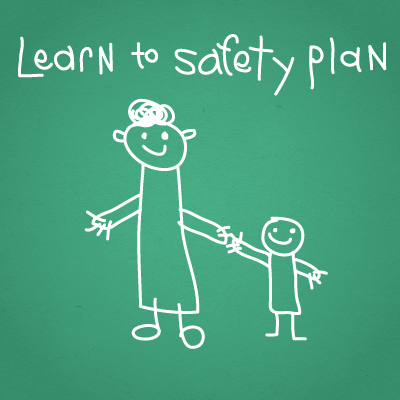 A safe system does not cause harm. Never events never happen. 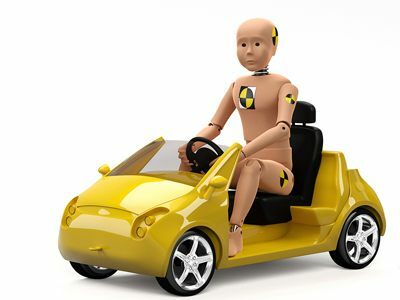 Safe systems are designed to be safe. The root causes of harm are deliberately designed out one way or another. But it is not always easy because to do that we need to understand the cause-and-effect relationships that lead to unintended harm. Very often we do not. In 1847 a doctor called Ignaz Semmelweis made a very important discovery. He discovered that if the doctors and medical students washed their hands in disinfectant when they entered the labour ward, then the number of mothers and babies who died from infection was reduced. And the number dropped a lot. It fell from an annual average of 10% to less than 2%! In really bad months the rate was 30%. 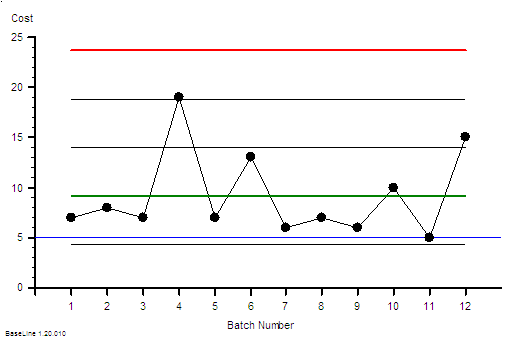 The chart below shows the actual data plotted as a time-series chart. The yellow flag in 1848 is just after Semmelweis enforced a standard practice of hand-washing. Semmelweis did not know the mechanism though. This was not a carefully designed randomised controlled trial (RCT). He was desperate. And he was desperate because this horrendous waste of young lives was only happening on the doctors ward. 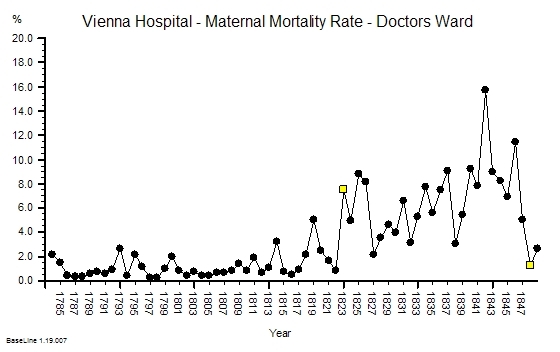 On the nurses ward, which was just across the corridor, the maternal mortality was less than 2%. The hospital authorities explained it away as ‘bad air’ from outside. That was the prevailing belief at the time. Unavoidable. A risk that had to be just accepted. Semmeleis could not do a randomized controlled trial because they were not invented until a century later. And Semmelweis suspected that the difference between the mortality on the nurses and the doctors wards was something to do with the Mortuary. Only the doctors performed the post-mortems and the practice of teaching anatomy to medical students using post-mortem dissection was an innovation pioneered in Vienna in 1823 (the first yellow flag on the chart above). But Semmelweis did not have this data in 1847. He collated it later and did not publish it until 1861. What Semmelweis demonstrated was the unintended and avoidable deaths were caused by ignorance of the mechanism of how microorganisms cause disease. We know that now. He did not. It would be another 20 years before Louis Pasteur demonstrated the mechanism using the famous experiment with the swan neck flask. Pasteur did not discover microorganisms; he proved that they did not appear spontaneously in decaying matter as was believed. He proved that by killing the bugs by boiling, the broth in the flask stayed fresh even though it was exposed to the air. That was a big shock but it was a simple and repeatable experiment. He had a mechanism. He was believed. Germ theory was born. A Scottish surgeon called Joseph Lister read of this discovery and surgical antisepsis was born. Semmelweis suspected that some ‘agent’ may have been unwittingly transported from the dead bodies to the live mothers and babies on the hands of the doctors. It was a deeply shocking suggestion that the doctors were unwittingly killing their patients. The other doctors did not take this suggestion well. Not well at all. They went into denial. They discounted the message and they discharged the messenger. Semmelweis never worked in Vienna again. He went back to Hungary and repeated the experiment. It worked. Even today the message that healthcare practitioners can unwittingly bring avoidable harm to their patients is disturbing. We still seek solace in denial. Hospital acquired infections (HAI) are a common cause of harm and many are avoidable using simple, cheap and effective measures such as hand-washing. The harm does not come from what we do. It comes from what we do not do. It happens when we omit to follow the simple safety measures that have be proven to work. Scientifically. Statistically Significantly. 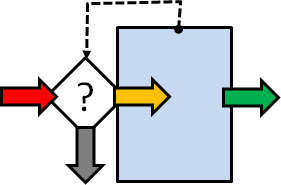 Understood and avoidable errors of omission. So how is this “statistically significant scientific proof” acquired? By doing experiments. Just like the one Ignaz Semmelweis conducted. But the improvement he showed was so large that it did not need statistical analysis to validate it. And anyway such analysis tools were not available in 1847. If they had been he might have had more success influencing his peers. And if he had achieved that goal then thousands, if not millions, of deaths from hospital acquired infections may have been prevented. With the clarity of hindsight we now know this harm was avoidable. No. The problem we have now is because the improvement that follows a single intervention is not very large. And when the causal mechanisms are multi-factorial we need more than one intervention to achieve the improvement we want. 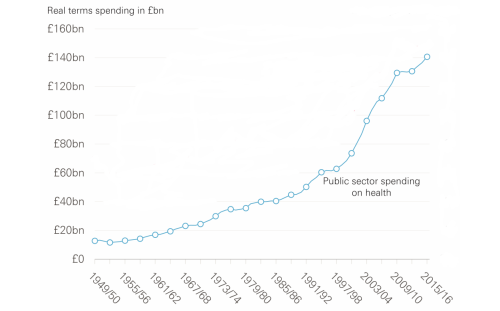 The big reduction in avoidable harm. How do we do that scientifically and safely? About 20% of hospital acquired infections occur after surgical operations. We have learned much since 1847 and we have designed much safer surgical systems and processes. Joseph Lister ushered in the era of safe surgery, much has happened since. We routinely use carefully designed, ultra-clean operating theatres, sterilized surgical instruments, gloves and gowns, and aseptic techniques – all to reduce bacterial contamination from outside. 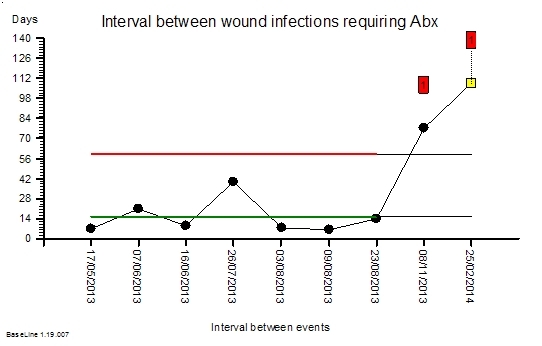 But surgical site infections (SSIs) are still common place. Studies show that 5% of patients on average will suffer this complication. Some procedures are much higher risk than others, despite the precautions we take. And many surgeons assume that this risk must just be accepted. Others have tried to understand the mechanism of SSI and their research shows that the source of the infections is the patients themselves. We all carry a ‘bacterial flora’ and normally that is no problem. Our natural defense – our skin – is enough. But when that biological barrier is deliberately breached during a surgical operation then we have a problem. The bugs get in and cause mischief. They cause surgical site infections. So we have done more research to test interventions to prevent this harm. Each intervention has been subject to well-designed, carefully-conducted, statistically-valid and very expensive randomized controlled trials. And the results are often equivocal. So we repeat the trials – bigger, better controlled trials. But the effects of the individual interventions are small and they easily get lost in the noise. So we pool the results of many RCTs in what is called a ‘meta-analysis’ and the answer from that is very often ‘not proven’ – either way. 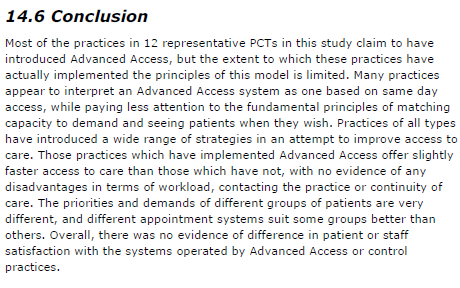 So individual surgeons are left to make the judgement call and not surprisingly there is wide variation in practice. So is this the best that medical science can do? No. There is another way. 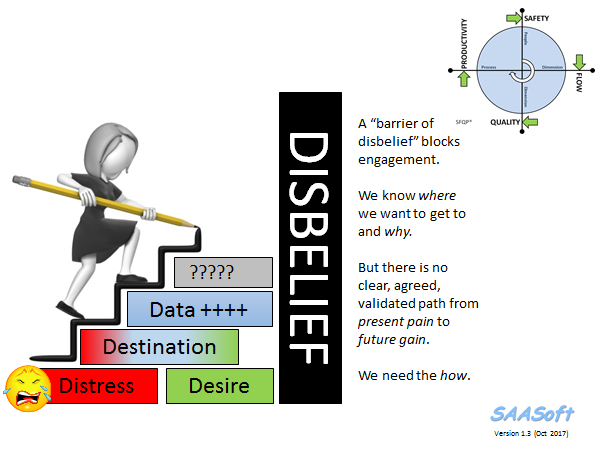 What we can do is pool all the learning from all the trials and design a multi-facetted intervention. A bundle of care. And the idea of a bundle is that the separate small effects will add or even synergise to create one big effect. We are not so much interested in the mechanism as the outcome. Just like Ignaz Semmelweiss. And we can now do something else. We can test our bundle of care using statistically robust tools that do not require a RCT. They are just as statistically valid as a RCT but a different design. And the appropriate tool for this to measure the time interval between adverse the events – and then to plot this continuous metric as a time-series chart. But we must be disciplined. First we must establish the baseline average interval and then we introduce our bundle and then we just keep measuring the intervals. If our bundle works then the interval between the adverse events gets longer – and we can easily prove that using our time-series chart. The longer the interval the more ‘proof’ we have. In fact we can even predict how long we need to observe to prove that ‘no events’ is a statistically significant improvement. That is an elegant an efficient design. Here is a real and recent example. The time-series chart below shows the interval in days between surgical site infections following routine hernia surgery. These are not life threatening complications. They rarely require re-admission or re-operation. But they are disruptive for patients. They cause pain, require treatment with antibiotics, and the delay recovery and return to normal activities. So we would like to avoid them if possible. 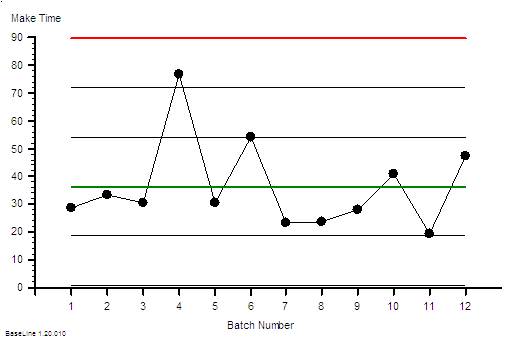 The green and red lines show the baseline period. 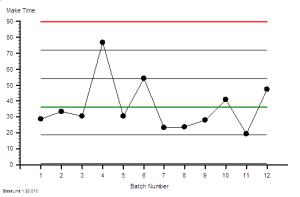 The green line says that the average interval between SSIs is 14 days. The red line says that an interval more than about 60 days would be surprisingly long: valid statistical evidence of an improvement. 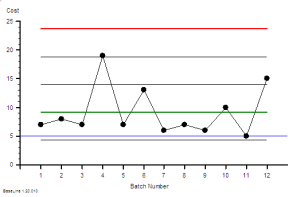 The end of the green and red lines indicates when the intervention was made: when the evidence-based designer care bundle was adopted together with the discipline of applying it to every patient. No judgement. No variation. The chart tells the story. No complicated statistical analysis is required. It shows a statistically significant improvement. And the SSI rate fell by over 80%. That is a big improvement. We still do not know how the care bundle works. We do not know which of the seven simultaneous simple and low-cost interventions we chose are the most important or even if they work independently or in synergy. Knowledge of the mechanism was not our goal. Our goal was to improve outcomes for our patients – to reduce avoidable harm – and that has been achieved. The evidence is clear. That is Improvement Science in action. It is essay number 18. And avoid another error of omission. If you have read this far please share this message – it is important.